It is interesting to see what brings people to your blog. Even though I have only made one previous rag quilt, "baby boy rag quilt" is one of the top three things that bring people to my blog! I know there are a ton of rag quilt tutorials out there, but since mine is a little different with the name personalization, and since I was making another rag quilt for my son, I thought I would make it easy for those who come upon my blog in their search for a rag quilt and write up a tutorial for how I make mine. - 1 strip of "batting"
- contrasting flannel scraps for the letters - choose scraps that have high contrast to your background fabric to make the name stand out and easily readable. - Equivalent of 2 yards flannel scraps OR batting for the middle of the quilt - For the quilt pictured, I used scrap flannel for the "batting". I did not want this quilt to be heavy or too warm, since it was intended as a cuddle blanket for my 2-year-old son. For my earlier rag quilt, I used actual low-loft quilters batting. (You can view it HERE if you want to see the difference in thickness, etc.) The color or pattern for the "batting" flannel doesn't matter since it doesn't show on the outside of the quilt (I used a medium-toned blue, again leftover from my previous quilt), making this a great opportunity to use up random scraps you might have lying around! - Sewing Notions - sewing machine, thread, rotary cutter and mat, acrylic ruler, scissors and iron. First: Prepare your fabric - If you would like, you can wash your flannel. I usually do, simply because I have found that flannel shrinks quite a bit, and I don't necessarily want it to shrink unevenly or excessively once this type of quilt is finished. But it is totally up to you. If you do wash it, I recommend clipping your cut edges with pinking shears to minimize fraying in the wash.
Second: Cut your fabric - Once I have squared up my fabric, I line it up on my mat and cut it into strips 5 inches X WOF (width of fabric - about 42 inches). I then carefully stack 2 of my (still folded) strips on top of each other, matching all my edges, and line the stack up straight on my cutting mat. Then, placing my ruler on top of my stack, I line up the edge of my ruler to the line on my mat closest to the raw edge of my fabric and make a straight cut through all the layers of fabric. I them move my ruler down 5 inches, line up my ruler again, and cut again. Repeat until you have cut the entire length of the strip into 5-inch squares. I continue this process with all my TOP and BACKING fabrics until I have 64 squares of each (128 squares total). I repeat the process with my middle "batting" flannel, EXCEPT I cut it into 4-inch squares. You will need 64 total "batting" squares. Here I cut two rows of fabric stacks at the same time. It makes the cutting go so much faster! Cut the name strip TOP and BACKING fabrics the same as the other 5-inch x WOF strips, but DO NOT sub-cut them into squares. Cut the "batting" flannel strip the same as above, only cut it 4-inches x WOF. Third: "Sandwich" your squares - Place one BACKING square, wrong side facing up, on your surface. Center one "batting" square on top. Place one of your TOP squares, right side up, on top of "batting" square, matching the sides with the bottom square. This is your square "sandwich". Repeat this process with all your TOP, BACKING and BATTING squares. I stack my sandwiches, turning every other one at an angle (as illustrated in the photo below), to make it easy to grab each sandwich while chain sewing. Place your stack where you can easily reach, and, taking one at a time, begin sewing diagonally, starting at one corner down through the opposite corner. Without cutting your threads, immediately begin feeding your next square sandwich through your sewing machine, corner to corner, and repeat the process until all your squares have a line of diagonal stitching through them. They should still all be connected and you will have a chain of 64 squares that you will now separate by clipping the stitches between the squares. Once they are clipped and re-stacked, you will repeat the chain sewing, this time sewing down the opposite corners to form and "X" through the squares. Once all your square sandwiches are sewn together, clip them apart and set them aside. Print out a sheet with the letters in the name sized to about 2.5 inches at the tallest point. Cut each letter out right on the line. Place your scrap flannel onto your ironing board, WRONG side up. Iron the Wonder Under onto the flannel, rough side DOWN. Cut out letters and carefully peel the Wonder Under paper from your applique letter. 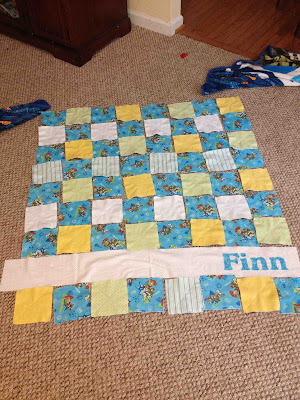 Decide where you want your name to be appliqued on your name strip. I placed mine so that the last letter was about 2 inches from the right-hand edge of the flannel strip. You will also want to make sure your name is straight. Simply line up your ruler evenly along the bottom edge of the flannel strip (In this case, I measured it 1 1/8 inch from the bottom edge) and line up the bottoms of your letters along the top edge of your ruler. You want to keep in mind that you will have a 1/2-inch seam on the top and bottom of this strip, so place your letters so that they will not get caught in the seams. Play with the spacing until it is pleasing to your eye. CAREFULLY remove the ruler without disturbing the letters. Gently place a hot, DRY iron (NO STEAM!) onto the top of the letters and leave on WITHOUT MOVING the iron for about 6-10 seconds. Lift the iron directly up and again place on top of any remaining letters, without moving the iron around. 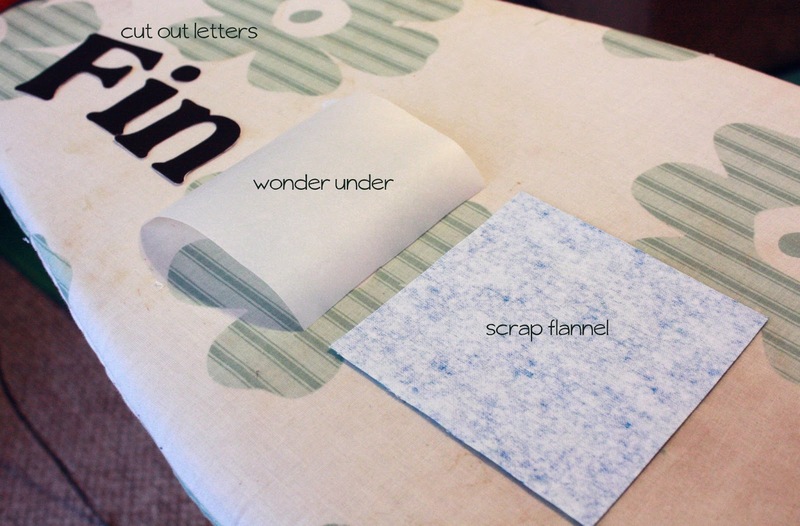 Repeat this process until all your letters are fused to the fabric. Sixth - Lay out your quilt and sew your rows - Take your sewn squares and name strip and arrange them how you would like them to look in your quilt. Gather them up by row and label the rows. (I take a picture of the layout with my phone so I can refer back to it if I get confused.) Then I take the stack of labeled rows to the sewing machine and and start sewing! Remember, you are putting your square sandwiches BACK sides together so that the seam will show in the front. 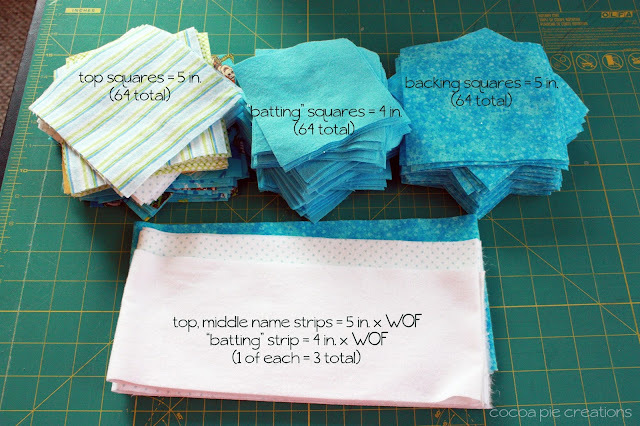 Using a 1/2-inch seam, sew each square in the row together until the entire row is joined. Repeat for each additional row. You will end up with 8 rows, 8 squares long. Once you have all your rows sewn, you are going to sew your rows together. Again with back sides together, pin two of your rows together along the long side, matching the seams. I pin and sew my seams open. Sew your rows together. Again, you will sew 1/2-inch seams that will be visible on the front of the quilt. Continue adding your rows, matching seams, until you have sewn SEVEN rows together. For the 8th row, add your name strip, again with back sides together using a 1/2-inch seam. You will probably have some extra length that will need to be cut off of the strip, so be sure to have the end with the name on it lined up with the right-hand edge of the quilt. That way you can cut any excess off of the left side - the side without the applique. Finally, sew a 1/2-inch border around the entire quilt. You are done sewing! Now comes the FUN part (Insert sarcasm here.) Clipping! This part is pretty self explanatory, but you will take scissors and start clipping all those 1/2 seams that you made on the front side of the quilt (and also the 1/2-inch border you just sewed around the border of the quilt). Make the clips about 1/4 inch wide, or less. Take care not to clip too far and cut the seam! When you get to the "intersections" of the squares, or the corners where the seams meet, I clip the fold open. 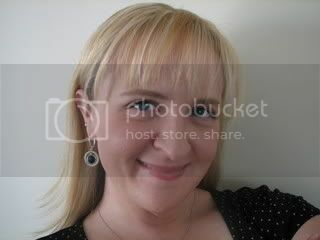 The photo below hopefully explains what I mean. I'm sure this isn't necessary, but it is something that I do to make sure the clips are evenly spaced and fluffed after the blanket is washed. Thanks so much for this tutorial. I'm still a newbie and I love all the step by step instructions! Thank you for the great tutorial. I will make my first rag quilt following these directions for my soon to be grandson in November! Awesome! Can't wait to try it for my baby boy (he'll be here in October)! I've been trying to figure out what pattern I'd like to use and haven't found one I just love. However, I LOVE the idea of having the name on it. Coolest one I've seen! What type of thread do you use? Just a regular thread or do you use something special to avoid seams breaking? Thanks! I just use regular thread. I haven't had a problem with seams coming apart. I do back tack at the beginning and end of each row as I sew them together, and on the 1/2 in. seam that is sewn around the perimeter of the quilt, but other than that, I don't to anything special or use any special thread. Good luck and I would love to see your quilt if you make one! Do you also back tack when you are making the sandwiches with the diagonal stitching or when you are sewing the sandwiches together to create the rows? Thank you for this tutorial! Here is my very first quilt for my 3 yr old's birthday! I should have back tacked a little more though! Some of my seams came undone, so I'm just patching it up before I wrap it! Thanks so much for sharing your pictures! I love your quilt! I'm sure your son will love it! And yes, back tacking is important, especially on the outside edges :) Glad the tutorial worked for you! I made this with cotton, minky, and cotton batting. It made for a warm and heavy quilt! I wanted it to fit a twin bed, so instead of making more squares, I made the squares bigger (9"x9"). Thanks for the tutorial! Your quilt is so adorable! I love the size. Thanks so much for sharing! I love to see all the beautiful quilts that are inspired by this tutorial. The font I used is called Cafe Rojo. It's great for appliqueing! I am newer to sewing and saw your tutorial and thought that I could do this! My concern is attaching the squares to form rows and then sewing the rows together. All of my fabric squares are 5x5 like you suggested, but I am concerned that the squares won't line up when I sew the rows together. Do you have any tips for that? Thanks! A wife, a mom, a daughter, a sister. I love to create. And with three little boys filling my day with unforseen adventures, Time to create is a treat for me. I am not perfect at any one thing, but I am willing to try my hand at anything. Check out my kid-friendly recipes at My Recipe Magic!